Happy New Year!! I'm back from holidays!! Miss me? ;) I know I should have posted more over Christmas but as I've been blogging for 3 years now most of my traditional meals are already posted (just click on the Christmas tag). Plus we went away to Ireland for the holidays - had a great time even though we didn't make it over until after Christmas due to the weather. Still, had a nice New Year's over there and glad all the travels went smoothly! 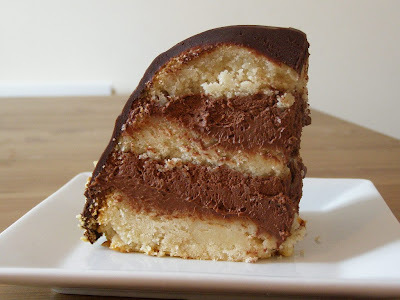 Well, back to the post - I made this cake years ago when I was vegetarian, it's on my old blog and was very, very good. Although I already have traditional Christmas meals posted I had yet to settle on a dessert and thought to veganize this one. It was a good call! This was so absolutely amazing!! I loved it even more than the original version - especially that mousse and ganache. I seriously think it's the best ganache I've ever had. It's very rich and decadent - we had to wait a bit after dinner before tackling it. The only thing I wasn't as keen on was the cake itself. I am struggling to find a really good vegan white cake recipe. I won't post mine here as I'm going to mess about with it but if you would like the one I used just e-mail me and I'll send it off to you :) It tasted great but the texture was a bit heavy and a little gummy, too moist to do the soaking syrup step. Still, it made an amazing cake and this will certainly be our traditional Christmas dessert from now on! Melt the chocolate and set aside to get to room temperature. Chill the whipping 'cream' then whisk it up with the icing sugar, it should get a little airy. When the chocolate is still melted but no longer hot quickly add it to the whipping cream and immediately whisk it up until all incorporated. It's important to do this quick so that the chocolate doesn't seize up. Whisk in the vanilla and Kahlua. You can use any vegan liqueur you like but Kahlua does go nicely in this. Finely chop the chocolate and place in a heat proof bowl. Heat up the cream and oil until the coconut oil melts and it just comes to the boil. Pour over the chocolate, let it sit a few seconds then whisk up until all the chocolate melts and you have a nice thick ganache. Whisk in the Kahlua. Grease a 4 cup oven safe bowl and dust with flour. Pour in your cake mix and bake until ready. Let cool in bowl on a rack then invert onto the rack to fully cool. I left mine overnight. When ready to assemble, wash out the bowl you baked the cake in and fully line it with cling film. Carefully slice the cake twice, giving you 3 layers. Place the top back in the bowl then spoon over half the mousse, place the next cake layer in, gently pressing down. Spoon over the rest of the mousse then place the last layer on, again, gently pressing down. Fold the overhanging cling film over the top so that it's all covered and place in the fridge for a few hours. Invert onto a wire rack with some baking paper underneath the rack (to catch the ganache drips) and peel off the cling film. Wait until the ganache thickens up slightly and isn't hot in any way. First give it a 'crumb coat' - this is a thin layer of ganache to make the last layer look nice and smooth. Chill until set then pour over the rest of the ganache, coating all sides and place back in the fridge to fully set. Decorate as you like but the chopped toasted hazelnuts I put around the bottom half of the cake went really well with this. Last time I put fresh raspberries which went nicely with the Grand Marnier flavours. Take the cake out about an hour before serving so it's not so cold, serves at least 8. Wow, what an amazing cake! Thank you for the recipe. And happy new year to yout too. I agree with your comment about finding 'white cake' that can soak up liquid without going over soggy. My sponge recipe works great for normal cake but is moist enough already and doesn't like extra moisture. The sponge from Bryanna Grogen Clark's tiramisu recipe is meant to work but doesn't. I've not been at all impressed by the sponge in VCTOTW. 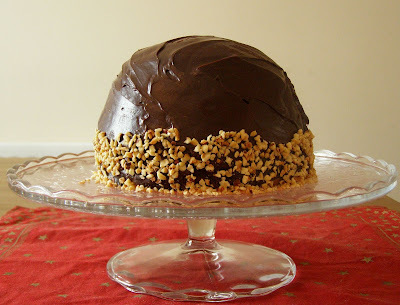 I made a cake similar to this a few years back for a birthday; 3 tier chocolate with kahlua chocolate mousse. It wasn't as pretty as yours however. this looks AWESOME! I can't wait to try this! You will need to post a cake recipe if you do find one you are satisfied with. I've never tried soaking cake before so I'm not sure what to suggest. In general I think cake recipes that use vinegar to rise have a moister/lighter taste and I prefer it to those that call for lots of egg replacer. Wow this looks amazing! Definately a cake to make if you have someone to impress.